Wolf Trap National Park for the Performing Arts hosts a wide range of concerts including pop, country, folk and blues, orchestra, dance, opera. Wolf Trap holds performances and offers educational programs all year long in three performance venues: the outdoor Filene Center and Children’s Theatre-in-the-Woods, both located at Wolf Trap National Park for the Performing Arts, and The Barns at Wolf Trap, located down the road from the national park and adjacent to the Center for Education at Wolf Trap. Filene Center is a 7,000-seat concert pavilion that is ideal for summer concerts. The seating is undercover with open sides that look out onto the rolling hills of the park. Lawn seating provides an area where patrons can relax and enjoy picnics before and during the performance. In addition to concerts, the Filene Center is a venue for a variety of education programs, artist master classes, special events, and a Holiday Sing-A-Long. The gates open one and a half hours before all performances. You are allowed to bring in your own food and drink and chairs are allowed on the lawn (though you will be asked to sit in the back, so you will not impair the view of other patrons). Lawn seats are first come first serve and performances are held rain or shine. Two 18th century barns serve as a unique venue for year-round indoor concerts with first-class acoustics. The larger barn seats 284 people on the main level and 98 in the hayloft. The smaller barn serves as a reception area. The Barns at Wolf Trap is a fabulous place to enjoy jazz, bluegrass, chamber music, folk, comedy, cabaret, and country music. Attend a summer performance of the Wolf Trap Opera Company. The doors open 30 minutes before each performance. The Barns are also rented for meetings, conferences, and private parties. Special family-friendly performances are held from late June through early August at 10:30 a.m. on Tuesdays through Saturdays. Music, dance, storytelling, puppetry, and plays are geared towards school-aged children. Ticket prices range from $8 to $10 and children under two are free. Advance purchase of tickets is recommended since many performances sell out. National Park Service Park Rangers lead nature walks after most Theatre-in-the-Woods performances. 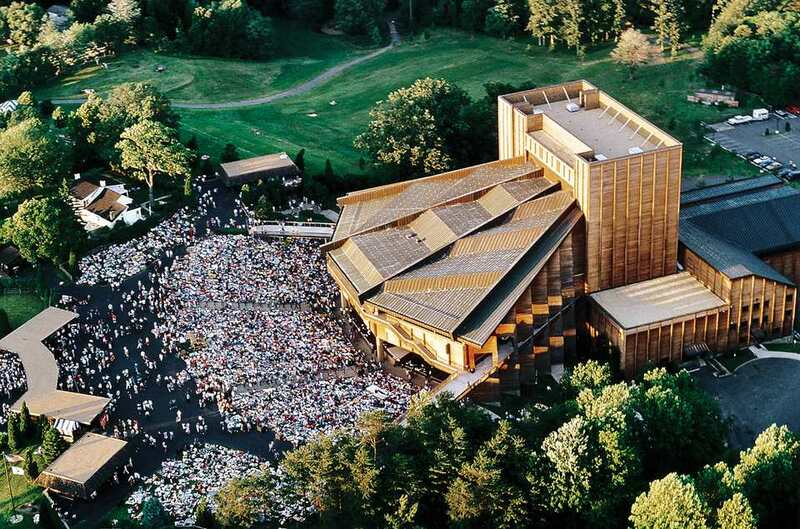 In 2003, Wolf Trap opened a state-of-the-art education facility to accommodate rehearsals, workshops, children's classes, master classes, meetings, and training sessions. The education programs include the nationally acclaimed Wolf Trap Institute for Early Learning Through the Arts, Children’s Theatre-in-the-Woods, a diverse array of arts education classes, grants, and a nationally recognized internship program. Tickets for Wolf Trap's performances can be purchased via the Wolf Trap Box Office, by calling 1 (877) WOLFTRAP or online at www.wolftrap.org For an up-to-date schedule visit their website. The park is located at 1551 Trap Rd, Vienna, VA. It is about 20 minutes from downtown Washington, DC. The Wolf Trap Express Bus travels from the West Falls Church Metro stop every 20 minutes starting two hours prior to show time. Driving Directions From the Capital Beltway (I-495): Take exit 45A to Route 267 West (Dulles Toll Road) toward Dulles Airport, Exit on to State Route 676/Trap Rd., Turn Right toward Trap Rd. The Filene Center will be on the right. Attendees are welcome and encouraged to bring their own food and drink, including alcoholic beverages. Wolf Trap’s OVATIONS restaurant includes an elaborate buffet as well as four gourmet picnic baskets which are available for pick up before the show. For details, visit www.wolftrap.org/dining. All coolers and bags, regardless of size, will be inspected before entering the Filene Center. Coolers must be 15" x 15" x 22" (48 quarts) or smaller. All other bags must be 14" x 13" x 10" or smaller.